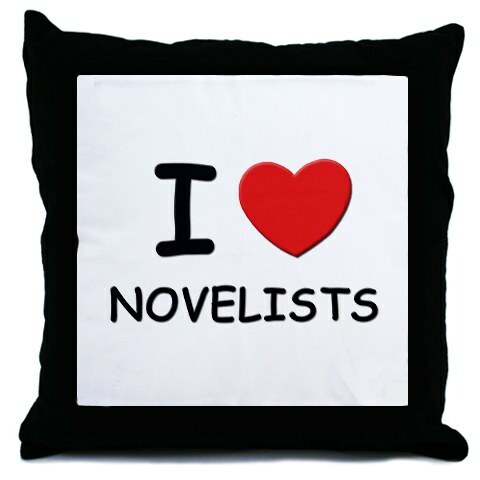 Throw pillow by, and available through Cafe Press. Within your recent post, The Girl Who (NSFW) Loves Ray Bradbury, you opined that "Once upon a time the novel stood at the pinnacle of culture and novelists were idolized. That time has, alas, passed…." As an aspiring novelist, I’ve chosen to be a bit offended by your statement. Taking offense these days seeming to be a pop-culture way of life, it’s probably one of the few ways, at my age, I can ever claim the dubious distinction of being cool enough to be part of that, so I will also choose to take some pride in my choice. How can you suggest that the time has passed in which novelists are idolized? How can I go on toiling at my tomes if you are going to dash my hopes that one day, perhaps also at age 90, I, too, can be so honored and lusted after by a gorgeous 23-year-old woman such as Rachel Bloom? What, then, shall be my motivation to write at all? Do you, sir, feel no responsibility as a potential tilter of public opinion to support us would-be, nay, all novelists? How can you disseminate such ugly propaganda? Have you no shame? This, then, is my declaration to fight the evil tyranny of your dream-killing ways. I shall stand in defense of all novelists, would-be or otherwise, and the rightful cultural standing of the novels they create by mounting a defense to counter your questionable practices, no matter how underhanded the tactics to which I must resort. The very fact that your post relates a story of a hip, intelligent, young woman who clearly idolizes Ray Bradbury underscores the ludicrous nature of your comment, how rife it is in venom and vitriol. Your egregious faux pas is self-evident. What manner of journalistic skullduggery and witchcraft do you proffer to back up your ill-conceived, misguided premise? Hush! Whatever it is, it simply cannot stand in the face of an endless string of evidence to the contrary. How can you deny the “pinnacle of culture” standing of the Harry Potter series? What say you of the incomprehensible, profound popularity of the Twilight novels? And what of the status to which their authors have rocketed? Idols? You speak of passed days of idols? Ha! J. K. Rowling and Stephenie Meyer have been elevated to modern-day gods! I won’t venture my opinion as to which novelists this applies, but some have been placed on their pedestals having vastly fewer skills and talents than those of the estimable Mr. Bradbury. I will stop here if for no other reason than to continue your trouncing is too easily redundant, and I have no need to stoop to your level of cruelty. But I’m sure, having been cast upon by the light of incontrovertible reason and justice, repentance is now your master, so all is forgiven. Hey, tell it to the Marines, buddy. Wait, you're an ex-Marine, as I've subsequently learned; tell it to yourself. Thanks for conducting and posting the interview, Mr. Gertz, and great applause to Ms. Bloom for her outrageous video. I loved it! Last but not least, a very Happy Birthday to Ray Bradbury! I’m sure not unique in claiming him as a lifelong friend and invaluable mentor, though we only met once in the flesh when he spoke at a function in Venice Beach, CA about 6 years ago. That was my honor and privilege! * With apologies to Bob Dylan. And with thanks to Kevin Jones for permission to print his letter. Do Bibliophiles Dream Of Electric Sheep? Dancing With the Stars in Hell! Catalonia Bans Bullfights, Doré Says "Bull"